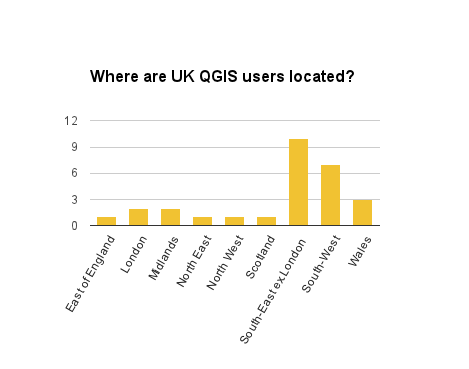 In the last blog I said that I’d pull together the results of a survey, to get a feel for UK qgis users. Unfortunately the number of responses was a bit disappointing with only 28 filling out the survey. However here is what was said…. I’m no statistician and the low return rate makes it harder to make concrete statements but a few things can be generalised upon. 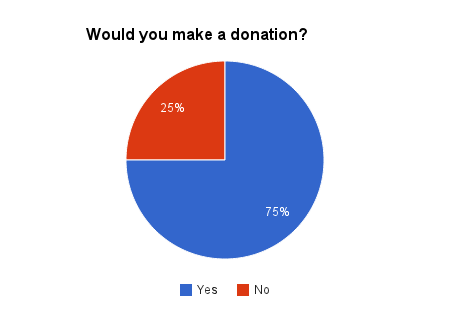 Two-Thirds said that they would be willing to donate to the QGIS project. This is great news; so hypothetically speaking if all those that said yes (21 of you) gave a tenner, that would be £210 we could donate to the QGIS project. I can’t remember the static on the number of pizza’s consumed at the QGIS developer meeting held in Brighton earlier this year was, but i should imagine that £200 worth of pizza could fuel a lot of developers to write a lot of cool qgis code! On the workshop side of things, there seemed to be a great interest in Plugins, Python and Databases. 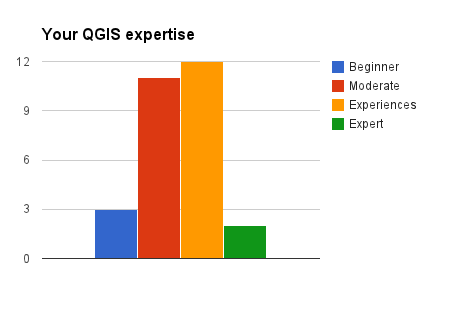 This has certainly given me some ideas on the kind of workshop that the QGIS User group could hold next year. Thanks to everyone that took part in the survey.